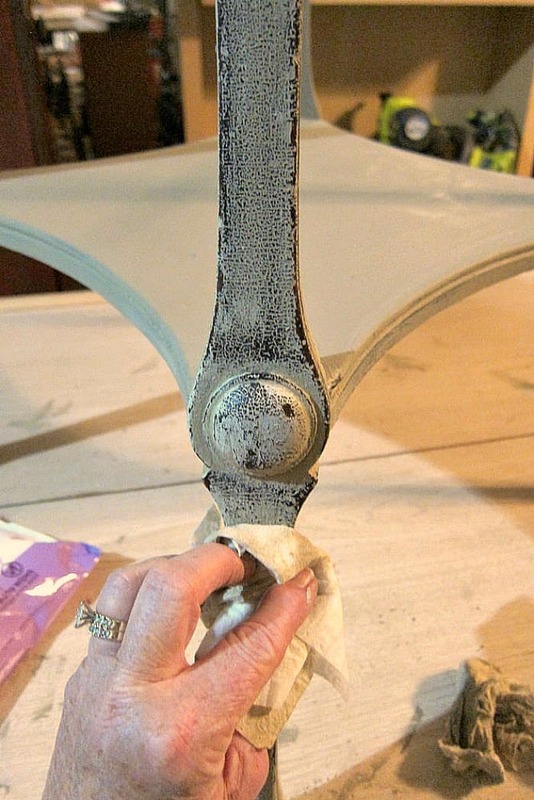 You can distress painted antique furniture without sanding and without the mess. 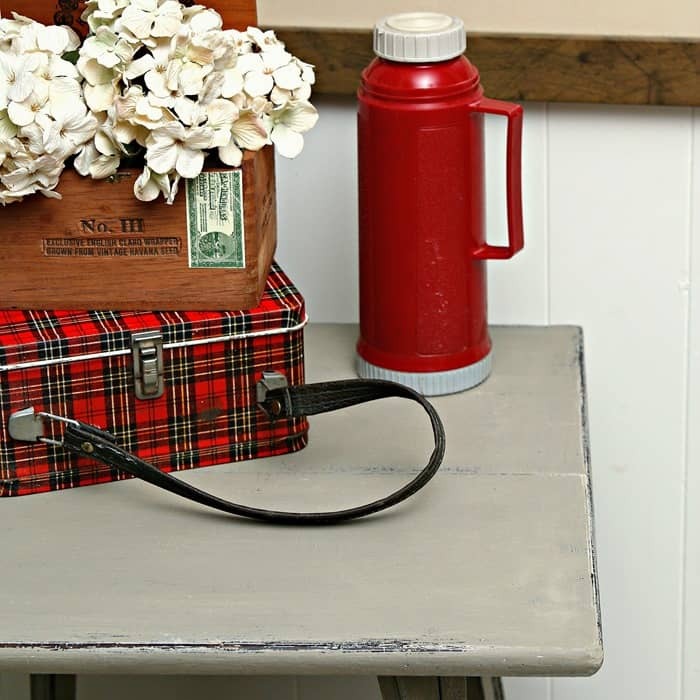 Highlight the original stained finish with this distressed paint technique. I used baby wipes to distress this painted antique table because I wanted to highlight the beautifully aged alligatored finish. 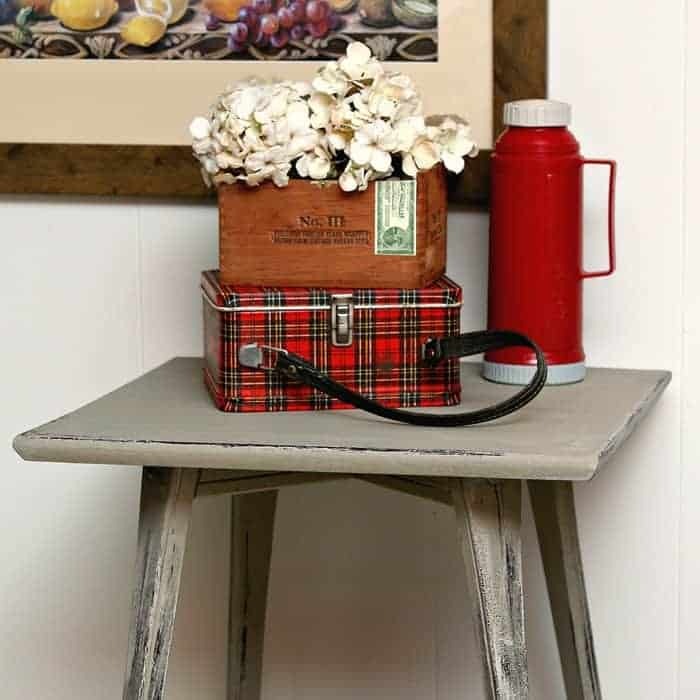 The distressed finish is the perfect compliment to my antique table. I think I did it proud. My original plan was to paint the table base black and paint the top with black and white stripes. I’m so glad I didn’t go with that plan. Too modern for this table. I’m sharing all the details for this paint technique because I want you to try it. Your project doesn’t have to be furniture, you can do this on home décor accessories too. I have tips and tricks learned after using the baby wipes on several projects. Keep reading. 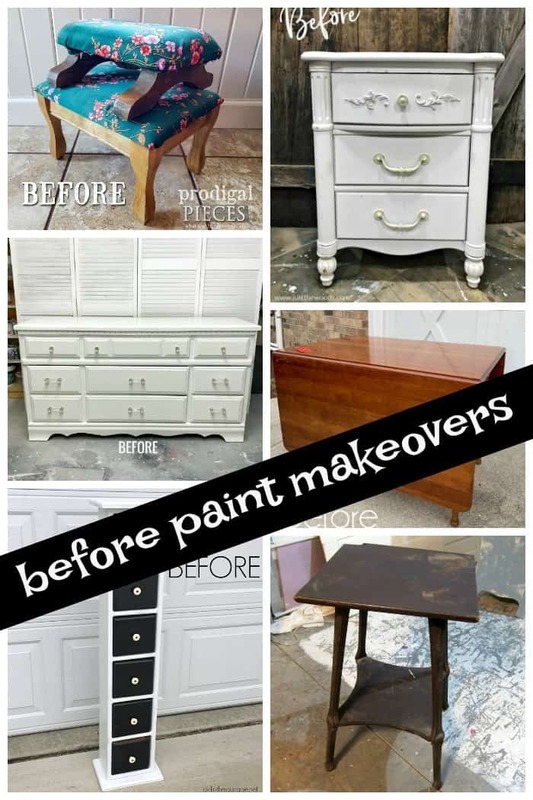 Today is the Furniture Fixer Upper Tour and I have to say the projects for our first tour of 2019 are awesome. Links are at the bottom of the post. I bought the table at my favorite junk shop for $15. The top was a mess. 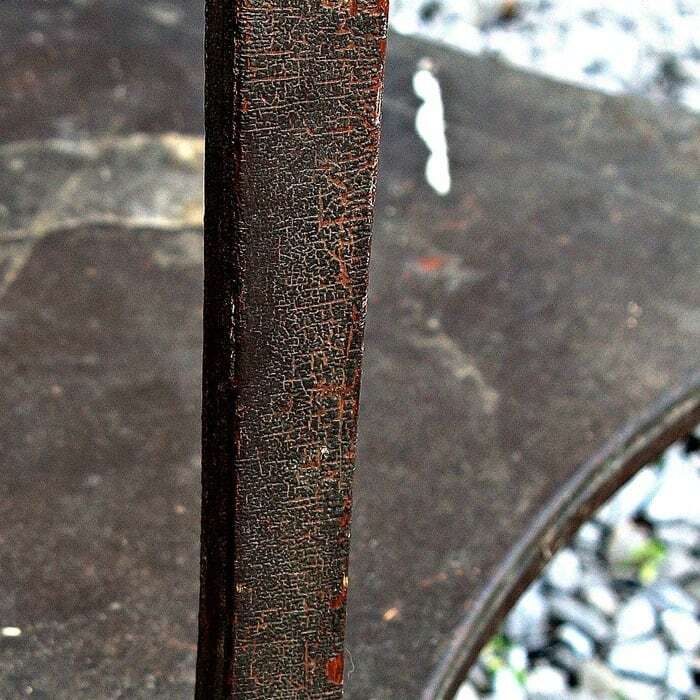 There was a chunk of wood missing from one side of the top and there were several places where the original finish was worn away. And then there was the alligatoring. The vocabulary dictionary gives this description of alligatored….. having the appearance of alligator hide. I think the rough finish has something to do with the varnish and heat…..maybe. I bet one of you can help me out. The table looks great. It doesn’t really fit my décor or I would keep it. The color isn’t exactly right and the height is all wrong for any place in our house. I applied one coat of Home Décor Chalk, color French Linen, and decided it was too light. No oomph. I went to my paint stash and found the Texture Chalk, color Wet Sand. Perfect. 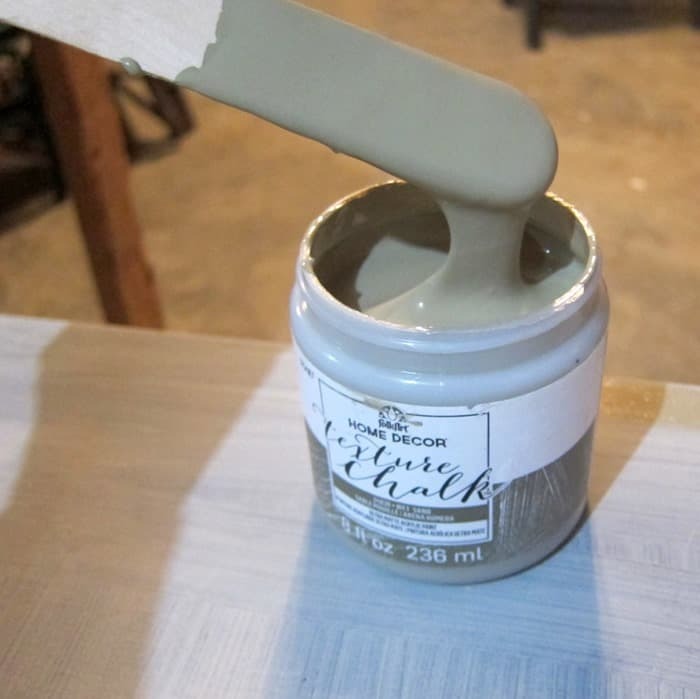 This paint is thick and can be mushed on for texture or brushed on for a smooth look. I went with smooth. Both of the chalk finish paints cover great. One coat of Wet Sand over the French Linen was all the table needed. No waste of paint because the first paint served as a basecoat. This is by far my favorite brush for chalk. The paint loads well and brushes on smoothly. Moving on to the fun part…..distressing the paint. Now to do this right you have to distress the paint just after it is dry. Wait too long and the paint will not come off unless you use sandpaper and that doesn’t give us the look we are going for here. 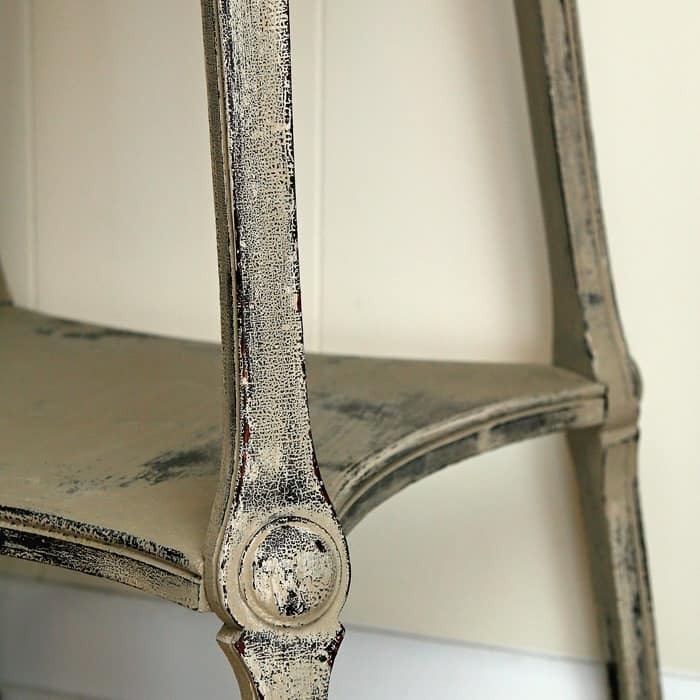 We want the dark original finish to shine through with the distressing….not raw wood. I worked with one section of the table at a time. Some of the areas didn’t want to let go of the paint. I wiped over these areas several times with the baby wipes to just barely dampen the paint. Then I was able to go back and rub……hard….to remove the paint. It’s up to you how heavy to distress. The baby wipes do get coated with paint and they might leave a very light film (almost unnoticeable) of paint over the distressed areas. TIP: I find it’s best to get a fresh baby wipe and remove this film in order to showcase the original dark wood finish. 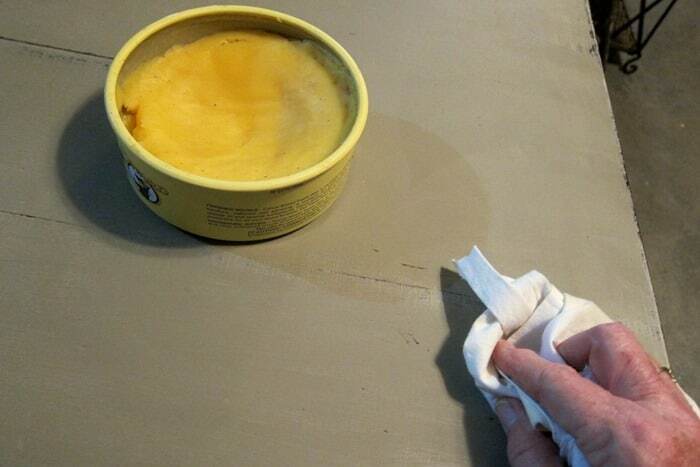 Just wipe over the distressed area several times with the fresh wipe. 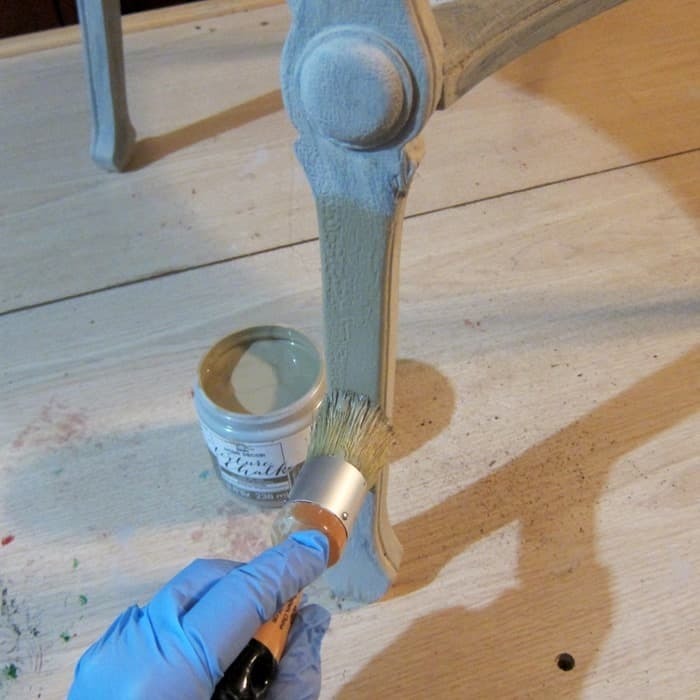 Last step is to apply a coat of neutral (clear) wax over the chalk finish to seal the paint. I sometimes skip this process because I like the flat look of the chalk. The wax gives it just a bit of sheen. There was no alligatoring on the top of the table. I distressed the edges and the top where the boards were glued together. The color is nice and neutral. 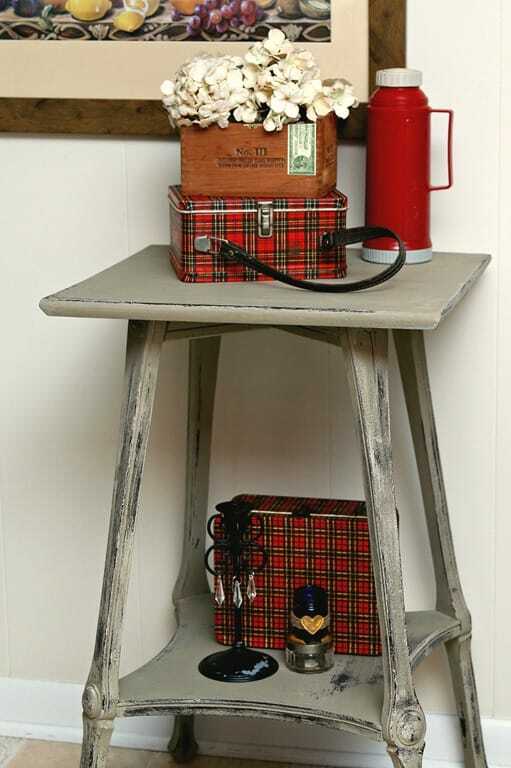 My red vintage finds make fun photo props and the red really pops against the sand color. What do you think of the baby wipe distressing technique? 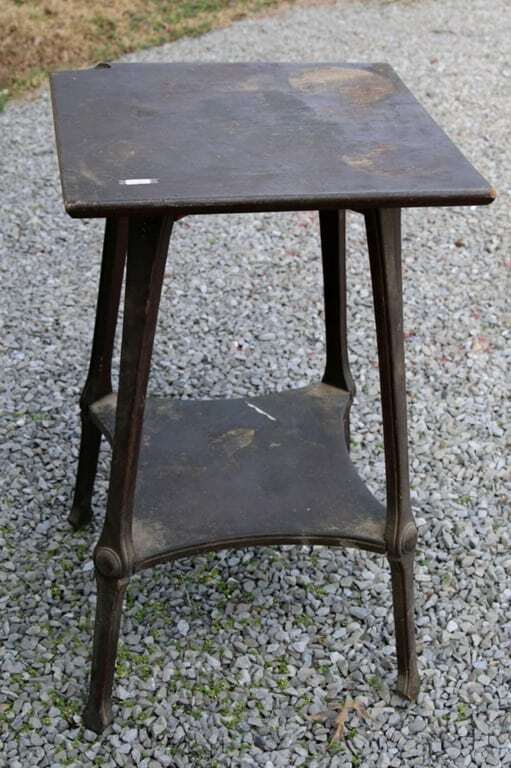 Do you think I did justice to the antique table? Another project I used this technique on can be found here….Turquoise Table. Even though the table was painted, it still looks very authentic and natural. Beautiful job, Kathy! 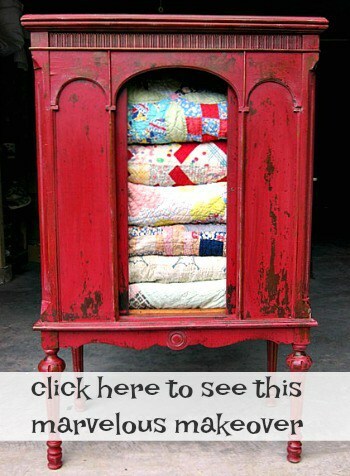 I have painted and distressed many pieces of furniture and rarely use sandpaper. I discovered early on using a damp cloth works well and is much easier. Your piece turned out well. 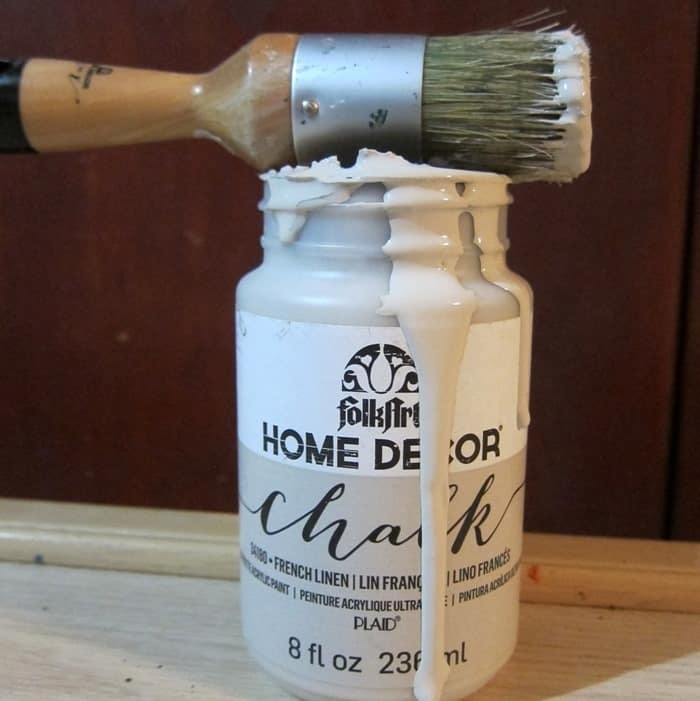 My favorite chalk paint is Rethunk Junk. 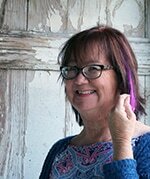 It goes a long way and dries with a soft shine. However, sometimes I add a coat of polyacrylic for added protection. Kathy, you have such a gift to see past the original condition of the pieces you buy. Thanks for sharing your knowledge. I love the look! 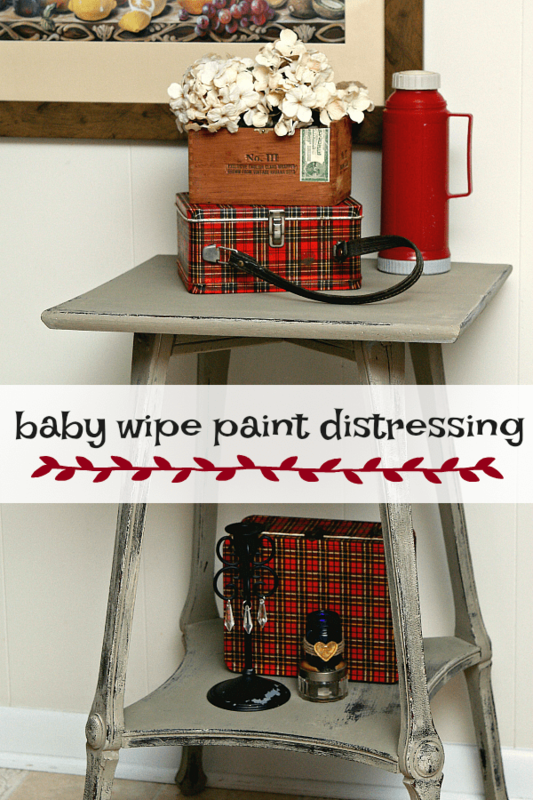 Speaking of baby wipes – did you know they are excellent for cleaning paint off stencils? It comes right off with the baby wipes if you use them right after you are finished with the stencil. Your table is great as usual. Love your projects and your “outside the box” thinking. the texture on this table is amazing Kathy! I love how you really enhanced it! Baby wipes, eh? This is a new technique to me and now I’m itching to give it a try. Love the finish, it’s perfect for this style of table. Wow ! Love the alligator finish . Makes you wonder where the table lived before it came home with you . Beautiful legs and detail on the legs . Baby wipes ? How cool ! Who knew ? I love the finished product . You did it proud and the red staging accents are perfect ! My sister had this very lunch box and got sent to the principals office for hitting a boy with it on the school bus ! Ahhh. Memories ! You did a great job on this table ! Kathy, I love the way the “alligatoring” looks after you painted the table and used your baby wipe distressing technique! Very pretty! I looked up the alligator thing and found this : ‘The alligatoring of varnish is caused by the use of quick-drying, short-oil, hard varnishes over long-oil elastic varnishes.’ Maybe someone revarnished the table at some time with the wrong stuff. Either way it did you a favour as the effect with the paint finish you put on is lovely – and so much easier than trying to scrape all that rough scaly finish off first. It looks like a lot of work but I love the finished product. I don’t know how you thought of using baby wipes in the first place. You never cease to amaze me. I appreciate you sharing the years of trial and error because it helps the rest of us so much. Happy Creating. How fun! Love the fresh new look, Kathy.